Georgie Ivens won the 400m. 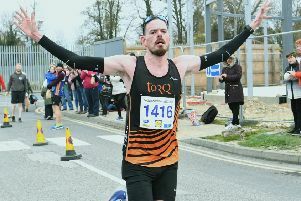 There was more glory for Nene Valley Harriers when they brought their successful track and field season to a close at Bury St Edmunds in the East Anglian League Final. Leading the way were the club’s senior women, who won their category, while there were second place finishes for the Under 17 men and Under 15 boys. The senior men and Under 15 girls finished third. On the track the senior women were in dominant form with Natasha Segal (100m B and 200m B), Lilly Hughes (100m A), Georgie Ivens (400m A), Megan Pusey (400m B), Megan Ellison (800m A), Casey Hilliam (800m B) and Emily Maltby (100m hurdles A) all hitting a winning note. Other first places were recorded by high jumper Rosie Jacobs and throwers Lydia Church, Priscilla Dadziea, Tierney Augustine, Kelly Lawrence and Elllie-Mae Stokes. Dave Brown ran under 50 seconds for the fifth time this season when winning the senior men’s 400m in 49.7, while Sam Hunt took the 800m A race spoils and won the 1500m B event. Robbie Shaw and Ken Baker won the A and B shot putt. The Under 15 girls finished just three points behind champions Basildon and were helped on their way by victories for Amber Park in the 800m and Jasmine Allen in the long jump. National champion Hannah Molyneaux registered her usual resounding wins in the shot putt and discus with Macey Carr winning the B shot putt. William Hughes achieved a sprint double for the Under 15 boys, and his twin brother Charles matched his sibling by winning both the discus and shot. Ronan Rawlins secured first place finishes in the 100m B and long jump A, Harry Smith won the long jump B, Kai Harrison the shot putt B and discusB and Luke Taylor the javelin B.
Nene Valley’s Under 17 men were a close second to Colchester with Chris Jones starring in the 200m B race and Josh Akinwumi and Alistair Pitts winning their 100m hurdles races. Pitts also out jumped his opponents in the B triple jump. Nene Valley’s men’s road racing team qualified for the finals of the National 6 Stage Road Relays after a spirited performance in the Southern Road Relays at Aldershot on Sunday. Harriers finished 27th out of nearly 100 teams and will compete in the nationals at Sutton Coldfield on October 3. The team and times for the 6k course were: Lloyd Kempson 19.28, Alex Hampson 19.31, Drew Warnes 21.07, Sam Hunt 21.19, Andrew Jakeman 20.15, Chris Wright 19.56. Nene Valley also fielded a ‘B’ team, and although finishing well down the field, teenager Jake Richardson ran an impressive 20:20 on the second leg. A Nene Valley trio of Ruth Jones, Barry Warne and Yvonne Scarrott finished 22nd, 23rd and 24th in the Cransley Hospice Half Marathon on Sunday. Jones and Scarrott were prize winners in their age categories. as was Eve Casbard of Bushfield Joggers who finished just ahead of the Nene Valley athletes. Eighteen year-old James McCrae ran the fastest time of the night when winning the main race in at Nene Valley’s 800m club night in a speedy time of 1:57.8. Alex Hampson also dipped under two minutes following McCrae home with a 1:59.2 clocking.